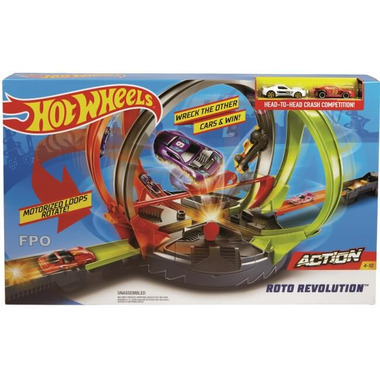 The Hot Wheels® Roto Revolution™ will test your skills in a head-to-head face off with friends. Challengers strategically launch their Hot Wheels® cars into the rotating set. With perfect timing you'll be looping around the set and crashing and smashing into your opponent's cars in no time! Last man standing in the loop wins! 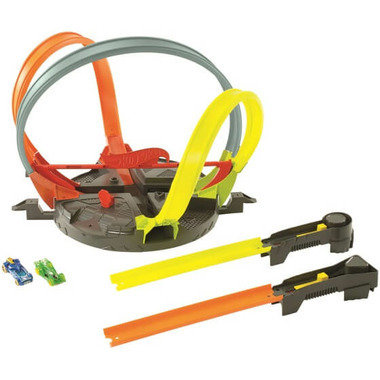 Launch into action with this interactive, strategic, skill-based track set with the fast action you expect from Hot Wheels®. Includes 2 launchers and 2 Hot Wheels® vehicles.